Your excursions to the most beautiful places in the region can begin! Thanks to our experienced chauffeurs, you will have a very relaxed ride. Destinations: Merano, Verona, Abano, Ligignio, Milan, Lake Garda, Venice, Kaunertal, Glacier Road, Innsbruck, Salzburg, Munich, Augsburg, St. Moritz, Lech, etc. -- depending upon the season. One of the most spectacular ways to cross the Alps: the Bernina Express (a UNESCO World Heritage Site) connecting Chur / Davos / St. Moritz with Valposchiavo (Switzerland) and Tirano (Italy). On the highest railway tracks across the Alps, the Bernina Express climbs alongside awe-inspiring glaciers before descending to the palms of Italy far below. This rail link between Northern and Southern Europe connects regions with at times remarkably diverse languages and cultures. 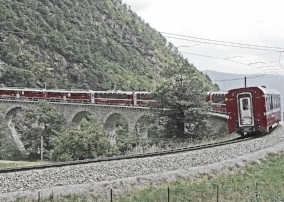 The railway is unique, idyllically blending with the Alpine landscapes around the Albula and Bernina Passes. The train negotiates 55 tunnels, 196 bridges and inclines of up to 7% with ease. At the highest point on this unbelievably scenic route, 2,253 metres above sea level, you will find the Ospizio Bernina. Here visitors can admire the cultural and natural surroundings and enjoy the Alps at their most impressive. The capital of Austrian Tyrol (and of the entire central Alpine region), Innsbruck offers a unique alpine-urban mixture of mountain and valley, nature and city. Sporty, dynamic, and cosmopolitan, while at the same time striking, strong and traditional, it is a city with extraordinary attractions such as the famed Goldenes Dachl (Golden Roof), Castle Ambras, Schwarz-Mader-Church, Hofgarten, Ferdinandeum, Zeughaus, Bergisel Ski Jump, and the Tyrolean Panorama and Kaiserjäger Museum. 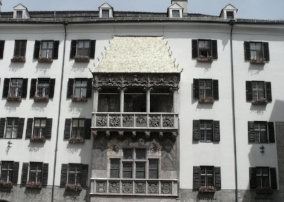 Merano lies at the confluence of the Adige and Passer rivers and today is the second largest city in South Tyrol. 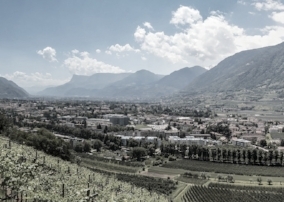 Four large valleys come together in the Meran Basin: the Vinschgau, the Adige Valley, the Passeier Valley and the Ultental. This exceptional location in the midst of the South Tyrolean mountains together with the medieval old town and the Mediterranean flair make Meran a popular excursion destination. Bizarre mountains and spectacular rock formations - the Dolomites: a mountain chain of the southern limestone Alps, created 200 million years ago. Not yet found the right place, we are happy to create an offer for you.